How we speak about and describe the virus can limit us and perpetuate the negative associations we make. World Aids Day is an opportunity to remember, to honour the past, so Positive Affirmation Day is a time to be present, alive and joyful. 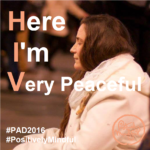 On the 2nd of December we can affirm that living with this virus does not prevent us from loving, contributing and creating a greater world for future generations. In choosing uplifting and light hearted ways to share the acronym H.I V. we show solidarity and connection, offer an opportunity to be open and to begin a 'positive' dialogue. We create the possibility for people to rethink what it means to be living with H.I.V. and celebrate all that we are and can be. If you are living with H.I.V., know a friend or family member who is, or simply wish to support and belong to this amazing event. Join and send your picture with 3 words beginning with the letters H, I and V in a message to [email protected] I will then make an image for you, so on the 2nd of December (or before) you can change your profile picture to share your unique message, and be part of spreading awareness and creating change. "Hózhó″ is a Navajo word that means “walking in beauty” – or living in a manner that strives to create and maintain balance, harmony, beauty and order. Hózhó is said to be the most important word in Diné (navajo) language and is loosely translated as peace, balance, beauty and harmony. To be “in Hózhó” is to be at one with and a part of the world around you.